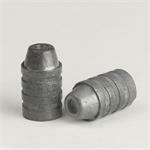 Full Bore Bullets are easy to load and do not need a plastic sabot! They give accurate 1" groups at 100 yards and require no lube thanks to the copper jacket that eliminates lead fouling and controls expansion. The hard-hitting patented Flex Tip™ design delivers devastating terminal performance at any range. This pack includes 15 full bore bullets 350 grain/.50 cal./.499-.507 dia. tapered. Hard-hitting patented Flex Tip design delivers devastating terminal performance at any range. NOTE: Due to weight, the shipping calculators used by USPS and UPS may show high shipping charges. Please call us at 205-533-8595 BEFORE placing an order for regional and flat rate pricing on shipping. We want to make sure our customers always get the best shipping rates we can offer. Round Ball .58 Cal. Dia. by Hornady - .570 dia. 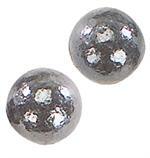 Hornady Lead Round Balls for MuzzleLoader Pistols & Rifles. 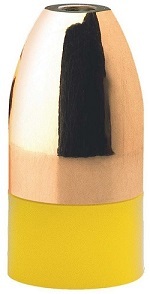 .50 Caliber - .490 Dia. Made by Hornady - 50 Pack. 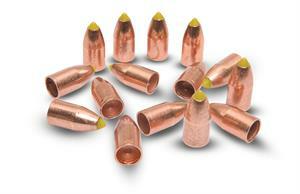 Revolver Round Balls (.451 Dia.) Precision Swagged Comes 100 to a box. 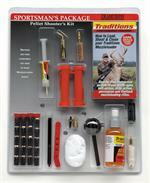 Manufactured by Hornady to Traditions high standards. Lee .454, 140 gr. Double Cavity Mold; Lee Round Ball Molds have the tangential cut off which eliminates the objectionable nib at the sprue. For a tight fit in .44 cal. revolvers using pure lead, will help prevent crossfire. See "More Info"
Rifle Round Ball, .36 Cal. Hornady/Traditions - Rifle Round Ball .36 Caliber 20 Count, .350 dia. Precision swaged to eliminate air pockets and deliver optimal accuracy. Pure lead replicates traditional design. Uniform in size, weight, and concentricity. 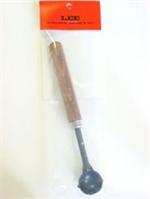 Ladle is a convenient size for bullet casting and works equally well for stirring metal alloy or skimming dross from the surface of the lead pot. Allows caster to use the dipper right or left handed. Handle Included, see "More Info". high speed melter with an infinite heat control and 500-watts of power. This melter easily handles 4-cavity molds and takes less than 15 minutes to melt 4 pounds of lead. This furnace is designed for ladle casting. See " More Info".